The hardest thing about the website is which frame to pick. So many to choose from and they are all beautiful. Very cool frame. Second time I’ve bought it! Adds a smoky/charcoal quality to my artwork. Love it! Love the frame with my plein air painting done during the Oregon Lavender Art show. 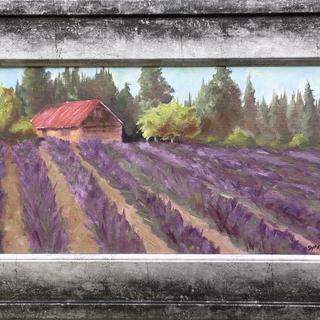 Love the frame with my Plein Air painting of a Lavender farm. Love the semi modern style of this as well as the patterning that means little scratches won't be noticed. The wide sides are easy to place hardware as the system that locks it in is great. This went on a winter scene and I hope it catches the eye and focuses attention on the art like a previous bronze one did where the painting sold in two days! I am very pleased with the frame and mat, as is the artist. It is the perfect frame and mat. The frame itself is lovely, exactly what I ordered. The sizing was also excellent. However the frame came bent. Two of the seams are wider gapped then the other two, as a result it will not sit on the wall evenly. I rigged something up so it looks acceptable but I don’t think I would use the service again. Hi Jason. Thank you for your review. We regret to hear that your frame arrived in this condition. This is certainly not the experience we wish to leave with you. Our customer care team can certainly make things right by setting up a replacement order for you. They are in the office Monday-Friday 8am-7pm eastern time and can be reached at 1-800-332-8884. We appreciate the opportunity to make this right for you! I purchased several frames from you and never was disappointed...these frames had poor quality joints and coloring was unattractive vs what showed on line. Hello Robert. We appreciate your honest feedback. Our goal is to deliver every order you place with us in the absolute best condition. That is what we strive for. I sincerely apologize that we missed the opportunity to exceed your expectations as we have done in the past. Please allow us to replace the frame for you at no charge. 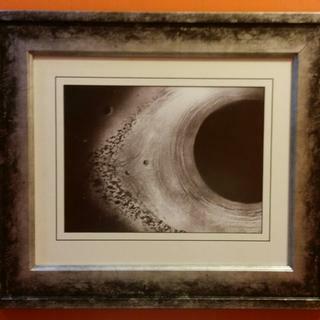 If you could please email us photos of the frame's condition, we are happy to rush the replacement order. We would like to share the photos with our quality assurance team. If you decide you would like to keep the frame, we are happy to offer you a reimbursement. Please let me know how we can make this right with you. We hope to hear from you soon. Thank you again for taking the time to submit your review. Modernizing an heirloom wedding picture. I was looking for a casual style and color to frame an oil of my son and granddaughter fishing is Hawaii. I hope this will do the trick. Liked this nice, "softer" alternative to black since I have a "cool" palette in house colors. I thought it was perfect for what I had in mind for a painting I wanted to hang in my Daughters Nursery. Framing an original abstract acrylic from an artist from Guadalajara, Mexico. The frame is modern in styling, feels substantial and the deep graphite and silver colors compliment the combination of bright and dark hues in the artwork. Just enough distress without creating texture on surface of the wood to frame graffiti piece. I am framing a black and white outdoor sketch and I hope it will blend yet make it stand out. is that feet or inches? BEST ANSWER: Hello. Our measurements are based on inches. Thanks! How do I insert my own image while selecting? BEST ANSWER: Hello! 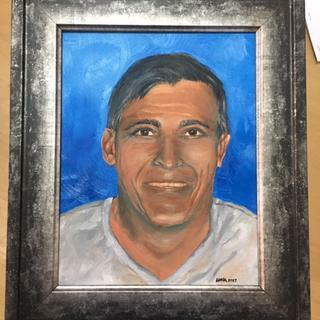 If you are hoping to view your image inside our frames, please follow this link: https://www.pictureframes.com/framing-projects/personal-frame-shop. If you have any additional questions, please let us know. Happy Framing!